The E.A.T.™ Methodology is the World Food Championships’ own proprietary scoring system and process that allows all WFC competition categories to be judged on the same criteria, in a consistent manner. Each entry will be judged on three key evaluation criteria: Execution, Appearance and Taste. The judges will give a score out of ten for each criterion, 1 being inedible, 10 being excellent. EXECUTION: Did the dish come together? In your opinion, did the cook successfully accomplish their recipe describes? Does the dish meet the criteria of the specific category? Within a category, “Execution” is scored specifically based on the category in which it belongs. For example, if a Recipe Category competitor submitted a taco recipe but turns in taco soup, they should not score well for they did not execute the given recipe. "Execution"will be evaluated by the judge’s interpretations of how the given recipe should look and be presented. Examples of why a judge might score poorly for execution may be a soggy bun on a burger or undercooked meat in a steak. Specific category requirements/challenges will be detailed to the judges in the same manner that they have been detailed to the competitors. It will be up to the judges to determine the success of the competitor at accomplishing the requirements of the round. APPEARANCE: Is it pleasing to the eye? Does it look appetizing? Do you want to take a big bite out of it right now? Although listed second, the criteria "Appearance" should be scored first based on the designated category. For example, a sandwich that looks like a soufflé should not score well. Secondly, only the primary dish is judged for "Appearance", meaning that sample dishes are not scored for its appearance since it may need to be portioned to fit on the turn-in tray. Judges will be instructed to base their assessment on the appearance of the turn-in, but should also consider the overall presentation of its components. For example, a Barbecue Cheeseburger that is over-saturated in barbecue sauce, obstructing visuals on the burger, may be scored lower than a dish that presents the barbecue sauce, cheese and burger in a balanced and visually pleasing manner. TASTE: Is it pleasing to the taste buds? Does it make you want to eat more? Is there an appropriate balance of flavor? The criteria “Taste” is defined specifically to the category in which it belongs. 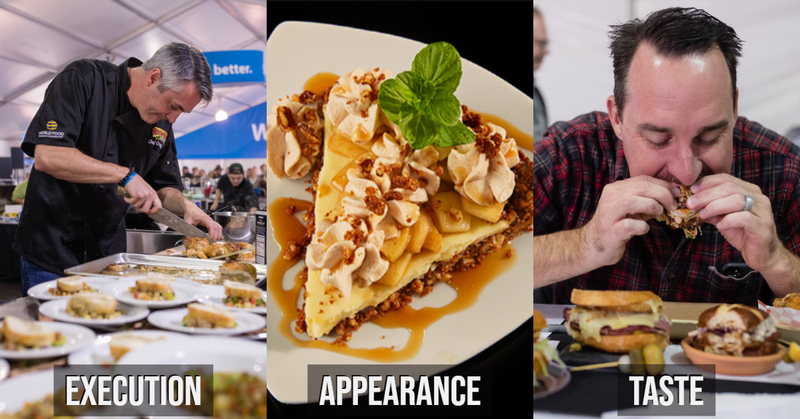 Judges will rate the dishes on a scale of 1, being inedible, to 10, being perfect. Additional"Taste" considerations will be based on the balance of flavors and ingredients used by the cook. Judges are instructed to NOT use personal bias when it comes to spicy or savory preferences. However, a Spicy Jalapeno Burger that is not spicy, but perhaps sweet due to another ingredient used, will score poorly compared to a dish that achieves the recipe's title and description. Taste – 50%, Execution – 35%, Appearance – 15%. Remember, E.A.T.™ certified judges are the only ones eligible to enjoy judging privileges at WFC. Find a Licensed to E.A.T.™ class in your area so you can judge at the next WFC!